I have no idea what happened this week, but Tuesday is when it all went nuts. We somehow acquired a stray cat, which I volunteered to take to the animal shelter (yes, I am allergic to cats) so I ended up driving a miserably hissing and mewing cat in a book bin across miles of construction and through a torrential rain storm. The basement flooded again. The a/c in the community room (where I was having a dance party) quit again. I did manage to get home alive, sans cat, at past 4! Thursday I made it through four more storytimes. My throat is now sore. Great turn-out for Miniatures in the afternoon - several repeat visitors and some new attendees at the last-minute. Friday - more outreach. Summer school is being held at the non-air-conditioned high school. I saw a lot of middle schoolers lying on the tiled floor in an attempt to cool off. It was miserable. But we checked out a lot of books! Saturday - the big day. Finally done. My feet hurt. Ok, I admit I took the schedule home to work on it. The cover of this, and the description, sounded really attractive. But nobody in my entire consortium bought it when it came out last year so I couldn't preview it. I finally decided to bite the bullet and get it myself. Samantha has always loved summer, being a lifeguard, hanging out with her best friend Jade. But this summer is different. Jade gets all giggly and silly around boys and there's something suspicious going on out at Danger Point. When Sam encounters ghosts, who insist that she has to help them save their home, things get even more complicated and she starts getting into trouble. Can Sam save her friendship and her home? Will she ever understand how Jade feels about boys? What is the mystery of the ghost of Mr. Wu? Soft pastels, fading to white in the ghost scenes, show an idyllic seaside scene with palm trees, a softly blue ocean, sandy beach, and spots of soft color in bathing suits, surf boards, and tourist stops. The main character is white, her friend Jade is Asian-American. The ghosts include a variety of prior inhabitants, from Chinese immigrants to the indigenous inhabitants. It's troublesome that many of the ghosts, especially the Native Americans, are shown only as dead people - and cultures. It's also problematic that Mr. Wu chooses a young white girl to be the new "savior". There is a lot of wish fulfillment in the end; dolphins saving Sam's life (they talk to her as a friend), the mayor turning out to be a con man who is arrested by the FBI, the discovery of treasure, etc. I also have questions about Sam's first "boyfriend" being a ghost. How, exactly, is that going to work? Verdict: This is a light and frothy beach read, a fun graphic novel to skim through and set aside. I'll be interested in seeing how future volumes handle diversity. An additional purchase. This had very strong reviews and I've liked some of Ellen Potter's books, but I'll be honest; it just didn't click for me. Hugo, a Sasquatch, lives in a vast cave system with his family and friends. He's a "squidge" or child, and still learning how his world works. In the Sasquatchs' world, humans are terrifying monsters, always to be avoided and feared. Hugo and the other squidges learn to sneak and hide, to identify forest foods to eat, and eventually they will perform the Acts of Bravery and become grown-up! Or, at least, slightly bigger squidges. But Hugo is curious about the Big Wide World. When he messes up their sneaking practice and endangers the whole class, he retreats to his room and, on a whim, sends a message out via a toy boat and the stream that runs through his cave. And a human boy writes back. Through their letters, the two become friends. But can a human and a Sasquatch be friends? And what will happen when there's a misunderstanding and the human boy won't talk to Hugo anymore? Even more scary, what if his family finds out? I saw the illustrations in a galley, so they were unfinished. They look like quirky, black and white sketches. Both Hugo and the human boy, Boone, have white skin. It's a gentle, sweet read, emphasizing the meeting between two cultures and how both Hugo and Boone are afraid of each other until they meet and discover that there are good and bad Humans and good and bad Sasquatches. What bothers me about this though, is that it doesn't correspond to actual history. Whatever your feelings about the existence (or otherwise) or Sasquatch, Bigfoot, and other crypto-creatures, historically when "primitive" cultures have met "civilized" cultures it almost universally ended badly for the primitive culture. So the Sasquatch's fear of humans is, actually, really well-founded. Ultimately, I felt like this was one of those "if we just sit down and talk we'll all get along" fantasies that overlooks the very real and tragic experiences of many marginalized cultures over many years. Verdict: I'm not opposed to books that engender tolerance of other cultures in children, and I've no problem with Sasquatch (although I personally think that if it existed they would have found poop). But this just left a bad taste in my mouth, especially since both characters were, rather blindingly, white (even if one is covered mostly in fur). For funny Bigfoot stories stick to the Yeti Files by Kevin Sherry and for books that introduce children to other cultures, try books that actually feature real people with real experiences. I’ve been looking for more fun, low level easy readers. I’m pretty much always looking for these elusive items. I don’t know how I missed this series by Kevin Bolger, author of the popular Zombiekins (whatever happened to the promised sequel to that anyways? ), but I’ve just discovered these and they look awesome. Fun with Ed and Fred focuses on sight words. The end pages list the books on a pseudo-blackboard with a peppy older lady in a purple dress and red glasses and a classroom that includes a blonde girl, a monkey in a baby bonnet, purple sheep, orange dinosaur?, magenta creature, and a bear in a striped shirt and beanie. Bolger, who is apparently a reading specialist (I didn’t know that!) explains why children need sight words and then the adventures of Ed and Fred begin. Ed is the orange dinosaur and Fred is the magenta creature. Ed is shown in various fun situations, at the beach, riding a horse, driving a fancy car, while Fred is increasingly unhappy with his own situation. When Ed gets a cute little dog, a huge monster dog grabs Fred. The situations get more and more crazy, with tornadoes, meteorites, and finally a monster. Luckily, Fred, much the worse for wear, has found a hiding place. Between two mattresses. Uh-oh. Those aren’t mattresses…. The story ends with Fred fleeing from a monster and some more sight words for readers to practice. Gran on a Fan focuses on short vowels. The end papers show some of the short vowels included in a picture with sky-writing clues being followed by a police dog, all leading to a little house… inside of which, on the title page, shows Gran (the purple-dressed lady from Fun with Ed and Fred) spinning frantically on her fan. The story, which is really more of a series of cartoons, shows a variety of creatures in a variety of crazy adventures. Gran spins on her fan, pets zoom around in jets (and crash into the ocean then end up at the vet), Nell falls down the well, Pop runs a race (and accidentally gets arrested instead of a mob, who gets arrested by the police dog), and so on. Each short story notes at the top which sound it is emphasizing and at the end of the book all of the words are repeated and divided up into their sounds. Ben Hodson’s cheerful cartoons really make the story; the smug Ed, outraged Fred, wacky animals, indignant Nell, and crazy situations, all pop off the page in color and comic style, with the occasional speech bubble. Readers familiar with Canadian cartoons may recognize the colorists’ name, Jo Rioux, as the creator of some excellent comics of her own (incidentally, I also have kids still wanting the next book in the Golden Twin series, which never went past book one!). Verdict: While a little older, these books are still great choices and sure to tickle the funny bone of fans of Elephant and Piggie, Toon, and Ethan Long. Recommended. The Cornell Lab has commissioned a series of books featuring various birds. I’ve had mixed feelings about some of the previous titles, but I did like this one. Rhythmic, lyrical poetry follows a dark-haired child across the beach. They have found a sea star, but it is caught out of their reach by a gull. The gulls squabble over the sea star, dropping and catching it in the air. The child follows eagerly across the beach, passing crabs and beach grass, tidal pools and stones. The child’s hands catch the sea star and they return it to the sea, safe from the gulls on Gull Beach. An afterword talks about bird life on a New England beach. The titular gulls are herring gulls, and there are also pictures of and information about sanderlings, willets, and snowy egrets. Other tide pool and beach creatures like crabs, sea stars, and horseshoe crabs are also described. Links and suggestions for environmental action are also included. The bird information includes links to hear their calls. Marstall’s soft illustrations show a wind-blown beach with colorful stones and small creatures busy about their lives. Birds are everywhere; gulls swooping across the sky, egrets and sanderlings crossing the sand in the distance or tucked into corners of the beach. This would be an interesting title to read before visiting the beach, but I do have some reservations. Marstall’s illustrations are pretty, but not clear or focused enough to make identification of the birds possible in several instances. I prefer the work of the Sills, whose clear, simple illustrations make it easy to identify the various species of both plants and animals pictured. Yolen’s poetry is lovely, but overly anthropomorphic, portraying the gulls as playing with the sea star for fun and the child saving it from “gullish slaughter.” This is more a reflective title to read, evocative of the calls of gulls, the spread of the beach, and the surge of the sea, rather than an informational, nonfiction title. The back matter is interesting and would make this a good book to pair with other titles for readers interested in birds, for classroom studies, or for poetry units. Verdict: An additional choice, one that would work well in concert with other titles. We maintain a birdwatching area and several science programs in our library and this book would be a good addition to our curriculum in this area. Our schools also do a poetry unit and would find this useful. History is going to the dogs in Sarah Albee's latest micro-history. She's examined poop, bugs, and fashion and now it's time for our best furry friends. Albee ranges across time and the world to look at the role of domesticated dogs in early history, the ancient world, and up to the current day. While mostly including western history, the author does not neglect more diverse cultures, dedicating sections to the role dogs played in Native American, especially Inuit, life as well as the history of the Pekingese and how dogs represent economics and class. There are many, many stories of famous dogs - dogs in war, dogs in movies, dogs who belonged to celebrities and dogs who were celebrities on their own. As the book winds to a close, Albee reflects on the history she's presented and the current state of dogs; the medical problems of "purebred" dogs, the uses of dogs in the military and in many other ways, as well as fun trivia like popular dog names. Author's notes include Albee's personal experience with dogs and some thoughtful notes on the truth of the stories told in the book. There are also extensive references and bibliography (or biblidography), places to visit, and an index. Verdict: Another crowd-pleasing title from Sarah Albee, this is sure to fly off your shelves and attract the interest of children and adults alike. Recommended. This week at the library; or, Now it's REALLY hot. Nope, now it's raining. Torrential rain on Monday. Julie the kitten made it in for Paws to Read rather late. The basement flooded. Tuesday morning, basement flooded again and the a/c went out in the program room. My associate worked with a developmentally disabled volunteer - this is a new venture for us and it went pretty well. Having them come at a time when we weren't busy worked best and we got all our toys cleaned! In a dramatic burst of energy (followed by a splitting headache) I finished July AND August of the STEM calendar! Quietish Wednesday, I did my first Library on the Go outreach at a daycare/summer camp/preschool. Great crowd for We Explore Outdoors - my associate's first summer and second solo programming series and people are turning out! The rest of the week was exhausting. My feet hurt. Abbie Wu is starting middle school. Her mom says it's the start of everything! But Abbie is pretty sure it's.... not. The thing is, she's always been in the middle of everything. The middle child, and now middle school? Nothing good happens in the middle. Abbie is even more worried when she realizes that everyone - except her - seems to have a "thing". She's not interested in hobbies, sports, or, well, anything. Except maybe getting some better lunches. It's really unfair that the sixth graders have awful lunches and don't get to share in the good lunches of the upper grades. Abbie didn't mean to start anything, but suddenly discovers that, somehow, she's now the leader of a lunch revolution! Could this be her thing? Or is it just going to get her in even MORE trouble? This notebook novel series from 2016 is still going strong, but I missed it originally and didn't end up purchasing it for the library. The main character is an Asian-American girl, which is a nice touch of diversity. There are lots of black and white illustrations, more cartoony than the stick figures that decorate many notebook novels, with lots of freaked out eyes, panicked waving arms, and moans of despair. The drama is extreme in this one; from an adult point of view, one can see that a lot of it is generated by Abbie and she might be better served with some therapy or destressing techniques instead of her mom's "everything will be ok" stance. The weird cafeteria arrangements and antagonism between grades sounded odd to me, but maybe our school is unusual in that, so far as I've ever observed, the older grades are generally very helpful to the younger grades. Verdict: If you need more notebook novels, this is an acceptable choice, but the extreme levels of anxiety made me feel a little meh about this one. Most of my readers stick to a few favorites - Dork Diaries and Wimpy Kid, and I prefer some of the other titles I've found to this one - Ellie McDoodle especially. Maybe Sergio Ruzzier is growing on me. Maybe not. It's hard to tell. This comic emergent chapter book (or challenging easy reader, depending on how you look at it) features the familiar trope of odd-couple friends. In the first story, Fox is trying to read a book when he is interrupted by Chick, knocking at his door. After some back and forth, Chick asks to use the bathroom... but when Fox hears loud sounds and goes to check, he sees Chick having a party with friends! Fox is annoyed and Chick and friends leave. In the second story, Chick is obsessed with Fox's diet. Fox likes vegetables and soup. But Chick knows that foxes are supposed to eat grasshoppers, moles, chipmunks.... and little birds. Wait a minute... Chick decides it's a good thing Fox like soup after all! In the final story, Fox is painting a picture. Chick would like a picture of themselves and Fox agrees... but Chick just can't sit still! All three of the stories feature comic panels and Ruzzier's distinctive style. Soft pastels, long noses or beaks, and little tufts of hair mark Ruzzier's art as well as highlight his quirky humor. At the end of the first story, Chick huffs, "I guess he didn't mean it when he said I could use his bathroom." and each story ends with a similarly snarky punchline. It's hard to see the two as friends; maybe they're more like neighbors, with Fox putting up with the annoying Chick. Ruzzier's art doesn't have the crisp lines that I'm used to seeing in emergent chapter books like Branches or Jump-Into-Chapters. He strikes me more as a Toon artist, with more emphasis on the artistic aspect than the plot. Verdict: An additional purchase if you have a strong interest in graphic novels for your younger readers or a lot of Ruzzier fans. A middle school kid tried to con me out of a fine amnesty coupon for a friend (who was not in the age bracket for the coupons). I said, "No, you're just going to give it to your friend." Kid gives me a shocked look, "You don't know that!" Me, "Yes, I do. I can read you like a book." "Because I am a librarian!" The popular characters from the Peanut Butter picture book series have recently been adapted to easy readers and this is their latest adventure. Peanut butter, a slice of bread with peanut butter and wire arms and legs, is nervous about his first day of school. He talks to all his friends and each offers him different advice - Cupcake suggests wearing sprinkles, Egg thinks telling a joke would be a good idea, and Jelly gives him a hug. But he’s still nervous! Luckily, all the other… things…. are nice and Peanut Butter has a good first day of school after all. The fun of this series is the wacky things running around, which manage to look sentient even though they have no eyes or faces. It’s totally illogical; some of the characters include a bottle of syrup, milk carton with a flower decoration, an ice cream cone (with ice cream), and a salt shaker. They all have little metal arms and legs and are posed as if they’re completing various actions. There’s even a bowl of soup that “talks” by lifting out noodle letters in a spoon. This is an intermediate level easy reader. There is not a lot of text, but the names of the different things are sometimes more complex. Readers who are familiar with the characters will enjoy seeing them again and the clever photography and little jokes, like the various inspirational posters, will keep their interest. Verdict: Purchase if you have fans of the series or are looking for more intermediate easy readers. Ryan T. Higgins first came on the scene in 2015 with the hilarious and tongue-in-cheek, instant favorite, Mother Bruce. He followed this up with more stories about Bruce, a wacky pair of mice, and now he's expanding into a very unusual new student in his latest tale. It's not until the tables are turned on Penelope that she realizes what it's like to be eaten... and manages to curb her appetite. Higgins' art is full of earth colors and lots of drool; Penelope's big, black eyes stare sorrowfully out at the reader, because she just can't understand why no one wants to be her friend! The bulgy-eyed goldfish, long-suffering teacher, and nervous children are all memorable and distinct characters. While the story points a lesson about friendship and fitting in, it's far from heavy-handed and the humor is definitely the main takeaway. Verdict: Sure to be a favorite when reading back to school books, this one is a must-have for your school displays and it may even make a helpful reminder for younger students, in an updated version of the classic mantra, "Do unto others" remind your students, "Don't eat your friends!" These two recent titles by Jennifer Swanson both deal with similar subjects - the science of space - but in different ways. Dr. E's Super Stellar Solar System addresses the science of space through the lens of geology. Dr. Ehlmann is a planetary geologist. In her alter ego of Dr. E, a cartoon, faux-superhero, she takes readers through the study of geology and how it applies to space, from space rocks to weather, to following water patterns. The nonfiction sections, with photographs and more realistic information, is interspersed with short comic sections starring Dr. E and her robot Rover as they explore the universe. In addition to National Geographic's familiar layout - lots of panels with extra information, graphics, photographs, etc., there are also activities and science experiments included. This is part of the "Science Superheroes" series, which previously included Dirtmeister's Nitty Gritty Planet Earth. There is a huge amount of information packed into this book, and readers will learn about famous scientists, the parallels between outer space and earth, from volcanoes to storms, as well as the cutting-edge technology used to study space. Back matter includes a glossary, index, credits, and more resources. The second book takes a more serious approach. Astro-naut/Aqua-naut compares the world of undersea research with outer space research, coming up with many interesting parallels. Readers will meet astronauts who study below the ocean with aquanauts, since in many ways conditions are similar to deep space. Each section connects the work done in the two different environments, for example, one section introduces the layers - first "going up" through the troposphere, stratosphere, mesosphere, etc. and then going down through the zones, epipelagic, mesopelagic, etc. The similarities and differences in blasting off and diving are shown, and the living conditions and challenges of a space or underwater habitat. 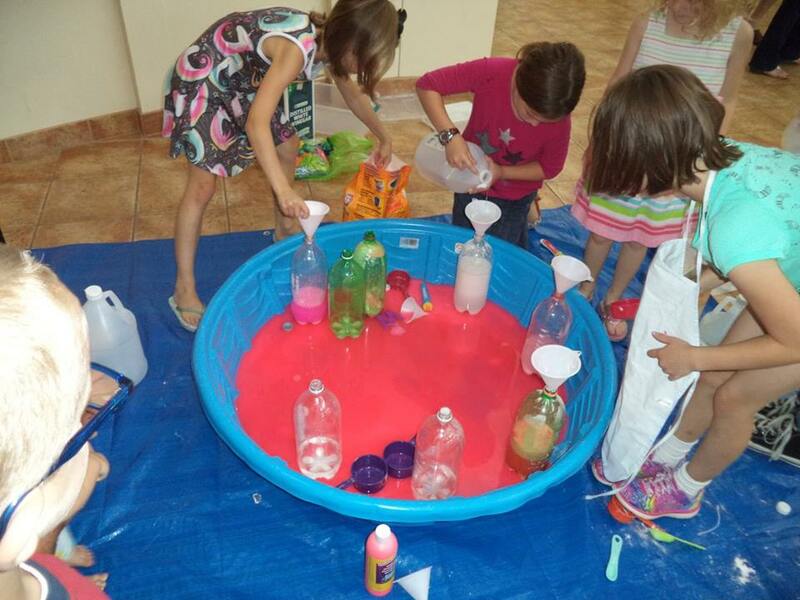 Along the way there are activities, interviews with scientists, experiments, and historical tidbits. While the first title feels geared towards a younger audience, especially with the cutesy cartoons, it's actually quite advanced, containing fairly dense text and a lot of mathematical and scientific vocabulary. In contrast, the second title felt more mature and for an older audience, but in some ways also felt simpler and more accessible. My own preference was for the second title; I've found that most of my readers aren't really interested in "fake" superheroes and the comic portions were a little too goofy. However, readers who are interested in space science are likely to enjoy both these titles. Verdict: Dr. E's Super Stellar Solar System is an additional purchase if you have a lot of interest in geology, space, and younger readers with high reading levels. Astro-naut/Aqua-naut, with it's accessible language, wealth of photographs and information, and carefully planned layout, is a must for your science section and would make a great choice for any number of school projects as well. These are read-alikes for Kazu Kibuishi's Amulet and Jeff Smith's Bone series. Graphic novels with cinematic color, action and adventure, fantasy and magic. The Three Thieves series by Scott Chantler is an award-winning Canadian webcomic that is published in the US by Kids Can Press. The story is set in a quasi-medieval fantasy world and features a young acrobat and sometimes thief and her companions who are on a quest to discover the secrets of her family and to find her missing brother. Along the way they run into corrupt politicians, dangerous knights, and other people with their own secrets. The Courageous Princess by Rod Espinosa is a classic trilogy featuring a strong and determined princess, dragons, music, adventure, and magic. It's recently been reprinted and a third volume added. It's more in the fairy tale vein, but classic fantasy that kids, both boys and girls, will enjoy. Kazu Kibuishi's popular Amulet series begins with a pair of siblings entering a strange, fantastical world and gets more serious as the series continues with magic, prophecies, wars, etc. Kids love the combination of magic and adventure and the art is cinematic and stunning. The Elsewhere Chronicles by Bannister and Nykko are, I think, originally a French comic series. They introduce a group of friends who travel to a magical world that turns out to be more frightening than fantastic. They are a little harder sell because they are in a picture book format, but once you get kids into them they're fans. Jeff Smith's classic series Bone has been around for a long time and could be said to have catapulted the graphic novel format for middle grade readers to popularity. The original graphic novel series consists of 9 titles. There are also several companion volumes and an illustrated prose series called Quest for the Spark. Bone is basically the story of a collection of animated cartoon bone characters that go on a journey. Along the way they encounter various friends and enemies. These are roughly based on fairy tale characters, but take them to a whole new dimension. They are set in the wild west but include Rapunzel using her hair as a lasso, dwarves, monsters, giants (he is Jack the Giant Killer) and a little bit of romance. 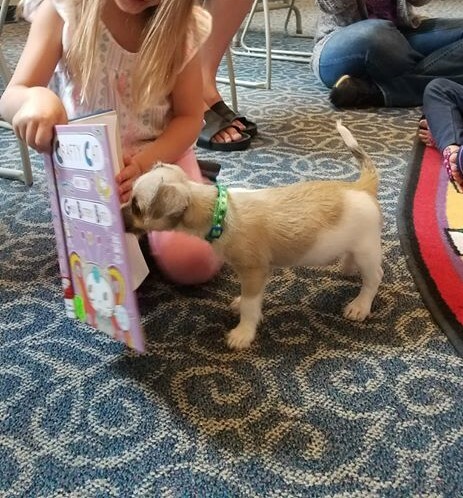 The animal shelter did show up for Paws to Read with a very cute puppy and the kids were ecstatic. I found some issues with my schedule - I hadn't accounted for the unfortunate injuries two of my three aides are suffering! It was very, very busy. My first Library on the Go of the summer went great - Headstart was very welcoming and my summer associate translated my bookmark into Spanish! It was great to be able to explain the program to everyone! Terri's first summer program, We Explore Outdoors, was very popular. More schedule issues, but all was resolved and I redid the rest of the June schedule. 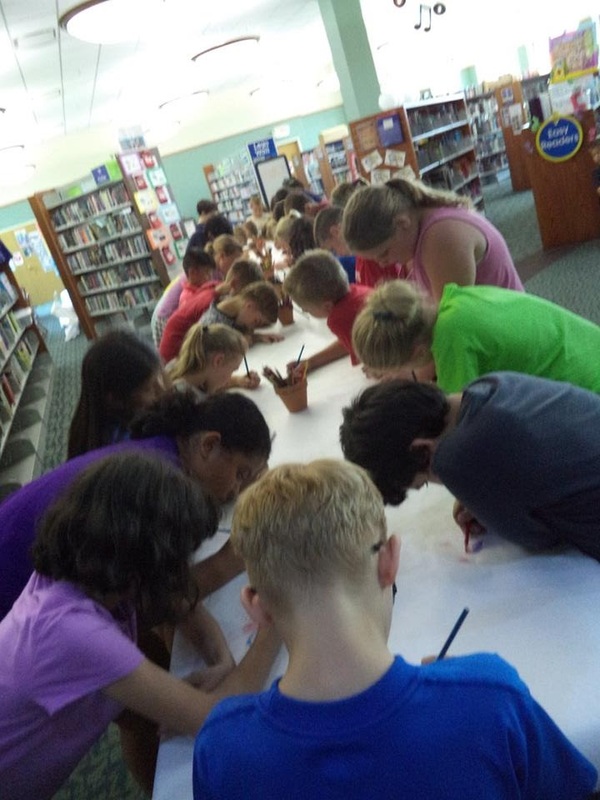 Our core group of anime fans showed up and (reluctantly) signed up for summer reading. My summer associate got their first experience with anime! It's hard to explain the difference I see between the US and UK imprints of Scholastic's graphic novel publications. David Fickling Books has several titles that have been popular in our library and they have nothing inappropriate in them, they just feel like they have a little bit more of an "edge" as it were. Throw in an existential penguin robot, some high-stakes shenanigans, and some dark dreams, and this is a fast-paced, superhero adventure with a twist. It's funny but also thoughtful, reflecting on what it means to be alive and a family. Colorful art and a futuristic, scifi world add to the intrigue. All of the characters, including Alex and Freddy's parents, display a wide range of diversity, as well as several characters in hijabs. Verdict: Sure to intrigue HiLo fans, this is a must-have for your graphic novel collection. There's a limited number of fantasy books for beginning chapter readers. Mostly they tend to involve fairies and lots of sparkly glitter. Epic fantasy, not so much. However, Scholastic's Branches imprint was extremely successful with their Dragon Masters series by Tracey West (I don't know about your library, but I had to buy multiple copies and referee fights over the remaining titles!) and apparently decided to branch out into an animal fantasy, a la Warriors, in this latest series The Last Firehawk. The story begins with an introduction: The fantasy is set in the land of Perodia, where the Owls of Valor fight against the evil vulture, Thorn, who is using the Shadow to destroy the land. 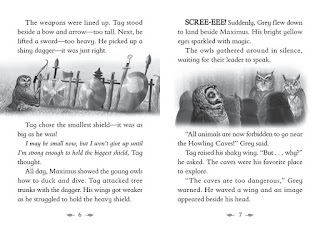 Tag, a young owl who is smaller than the others, tries hard to live up to his dream of being an Owl of Valor. Appropriately, a classic fantasy map is also included. Tag and his friend Skyla, a squirrel, rescue a mysterious egg from the evil tiger-bats, servants of Thorn. When the egg hatches, they discover it contains a firehawk, long thought to be extinct. Once upon a time, the firehawks had magic that could defeat Thorn and his Shadow, but their magic was contained in a gem which has since disappeared. Tag, Skyla, and the firehawk, named Blaze, set out on a quest to find the magical jewel. Digital black and white illustrations are on every page. Most of the animals look "normal", excepting the weird tiger-bats, but the owls wear armor, as does Skyla at times. Some of the art is blurred and the faces a little distorted. This is very classic animal fantasy; owls and squirrels are "good", vultures and bats are "bad". There is a magical map, legends, and a dangerous quest for a magical artifact. The hero (male of course) is the smallest and yearns to be part of a group of "knights" but ends up proving himself in a different way. However, just because it may seem old hat to a regular fantasy reader doesn't mean young readers new to the genre won't enjoy it. The story moves quickly and is written smoothly and briskly, with just enough peril to keep the story interesting. There are gentle lessons about working with your strengths, accepting the help of friends, and trying even when things seem hopeless. Verdict: I think the art does the story a disservice; I don't expect it will be as popular as Dragon Masters because of the lack of art and human characters to relate to. However, it was a good story; even I want to find out what happens next! Recommended to add to your Branches collection. I picked this up for the library because the bright cover was attractive and was delighted to discover the interior is equally whimsical. Each spread shows two improbably colored animals and poses the question: what would happen if they were mixed? The following spread shows the result. A giant, vivid blue whale plummets through the sky, landing on a startled yellow lion and creating… a rather glum-looking “green whion.” The mixes get more and more weird, a “turquoise rhortoise,” a “chartreuse kangamoose,” and my favorite, a “violet brizzly.” The third to the last spread shows a swirling ring of mixed and unmixed animals which combine to form a marvelous creature on the second to last spread. It’s unnamed, but has blue wings, a yellow trunk, green elephant legs, stripy red body, and so on. The final spread shows spots demonstrating the different color combinations, with a red monkey juggling a few extra balls. The vivid colors add excitement and interest to the quirky book. While the combinations are too advanced for most toddlers, they can still enjoy the combinations and colors and will be delighted with the wacky animals that are created. Verdict: A bright new entry in the world of board books, sure to fly off your shelves and delight little ones. Recommended. A long time ago, (well, not that long, but probably before you can remember!) people didn’t send emails and texts - they sent letters through snail mail. Patton’s soft colors show a sun-washed landscape and four unique snails, each with their own personality. Postcards, collage elements, and sketched in details pop against the water-washed background. I like to write letters myself and it’s certainly a fun thing to introduce kids to. Although the book was sweet though, I didn’t care for the illustrations, which had a very indistinct, swashy look, as though they’d had water dumped over them. The text is a little long and complex for the average storytime as well. Verdict: An additional choice if you have teachers who want to encourage letter-writing; most readers will be more interested in the workings of the real-life post office. However, it’s a sweet story and if you have a large collection or want to expand your books on postal services it could make a nice addition. As I continue updating the 900s, I’m constantly looking for additional materials on some of the most popular historical events like World War II. It can be tricky to find materials that are well-researched and written, cover the basic information (which many kids don’t know) but also offer additional perspectives, stepping outside the traditional black and white presentation. I was very interested to see a new series from Capstone that seems to promise this in its unique presentation. “Perspectives Flip Books” include the same major historical event from two different perspectives. This one covers the attack of Pearl Harbor from the American and Japanese perspectives. One side of the book covers one perspective, flip it over and read about the same event from a different perspective. This includes a blow-by-blow account of the attack with eyewitness quotes and inset information on people like Doris Miller, an African-American hero who was denied recognition due to his color or Japanese ambassador Kichisaburo Nomura who tried, unsuccessfully, to negotiate peace. Both stories share a timeline, further reading, and glossary, but have their own individual index. While brief, each story lasting about 30 pages, they do a good job of conveying the basic events as well as exploring some of the different perspectives. Otfinoski touches on some of the reasons behind the war, mistakes made by both sides in the attack, and overtures of peace after the war. Verdict: I’d like to see more titles from this series to make a really informed decision, but I think this is what I’ve been looking for and I plan to purchase the series to fill out and diversify my 900s. Recommended. I had to make a last-minute change on Wednesday. There was thunder, the third-graders couldn't walk over, so instead of the big art field trip I had planned, my colleague and I hauled baskets and baskets of books over to the school. Of course, it only rained while they were being carried out to our cars! 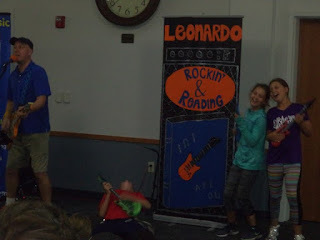 I did a quick spiel for summer reading with the kids then those with library cards checked out regular library books and those without got Library on the Go books. We did check out about 100 books, give or take, but I still lament my lost art field trip.... It did work out on Thursday though! Published simultaneously with The Thrifty Guide to Ancient Rome, this time travelers' handbook takes readers back to the American Revolution. Written like a guidebook, this includes starred reviews for the accommodations (including prison ships and Valley Forge), people to meet, and landmarks to see. There are also frequent interjections from the indentured servants, I mean authors, and Finn Greenquil, futuristic CEO and dictator of Time Corp. The narrative is a pretty standard story of the American Revolution, including Paul Revere's ride, George Washington's difficulties during the war, and the Continental Congress. It does have some additional notes regarding slavery and the Founding Fathers, and famous people do include some African-Americans. There is also reference to some of the African-Americans who fought on both sides, trying to find the freedom that the new country denied them. This is light and amusing, a good introduction for readers who aren't interested in history, or even those who are. I did feel that women were largely overlooked, several pivotal figures being left out. It's also hard to swallow the "humor" of Finn Greenquill who supposedly owns and oppresses the US while reading about the colonists who fought and died for freedom. Verdict: While I still see a lot of issues with this, I admit that I liked the series enough to read a second title and will probably purchase these. Fans of I Survived, Sarah Albee, and Nathan Hale are sure to enjoy this latest adventure and humor-packed incursion into history. Me to 2nd grader, "I can't wait to see your class for their field trip at the library! We're going to do a really cool and messy art project." 2nd grader, looks at me dubiously, "I don't like messy things. Or anything that gets my hands messy. Or art projects that make a mess. I don't like getting clean afterwards either." Me, "so basically you like to preserve your equilibrium at all times"
Me, "you don't like to change"
2nd grader, still dubious now that I have been revealed as the creator of mess and not just the purveyor of awesome books "can I just read a book instead?" Gum Girl is back in her third adventure - and she's got sticky problems! Gabi Gomez' dad, a dentist, has said no more gum. But she didn't listen, she had to keep turning into Gum Girl and saving the day! Now she's at the dentist with a sore tooth and a new superhero is moving into town, Ninja-Rina. She's got to do a project on what it means to be a hero, bully Natalie Gooch is selling Ninja-Rina t-shirts, and everybody seems to have forgotten about Gum Girl. When Gabi discovers the secret behind Ninja-Rina, the two are at odds. Gabi just wants to save the town, tell her parents the truth, and finish her essay. But... maybe she cares a little about what people think? What does it really mean to be a hero anyways? As you might guess from the cover (and yes, it smells like sour apple!) Gum Girl's usual pink is being taken over by green. However, the art still has the trademark Gum Girl look, with lots of bold, black lines, cartoon faces, and comic-style action. I love that this series features a Latina whose dad is a dentist! While I don't have a lot of readers interested in the faux-superhero genre, they do like Gum Girl. It's heavily illustrated, features lots of goofy humor, and has a very relatable main character. It's a little more challenging than your average beginning chapter book, but plenty of illustrations and a bold font make it a good choice for a fluent 2nd grade reader up to a struggling 4th grader. The one problem I have is that popular beginning chapter book series tend to come and go overnight. With only three titles in this series and the long waits between titles, fans tend to grow up or lose interest while waiting for the next installment. Verdict: I think this is worth a little extra promotion; whenever a new Gum Girl comes out I do some booktalking and pop it up on the staff picks and soon there's a new group of readers excited about the bubble-icious adventures of Gabi Gomez. Recommended. Ten cute little owls are staying up late - they're having too much fun to go to bed. But Mama is calling and one by one the little owls flutter down to bed as the sun begins to rise. The final spread counts the owls from 1 to 10. 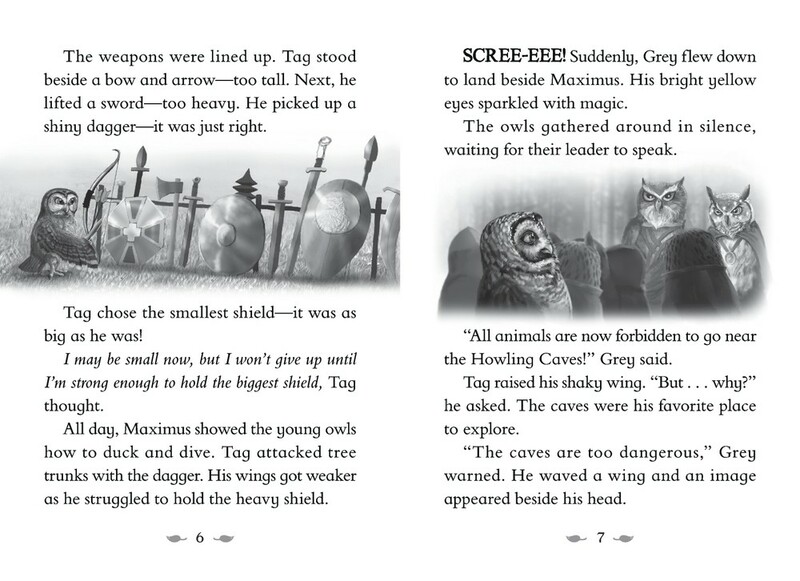 The book is a tall rectangle with die cut shapes over different owls. As you turn the page, the die cuts reveal details like smiling caterpillars, cute butterflies, and smiling spiders, and cover the owls as they fly away one by one. The text is based on the old "Ten Little" nursery rhyme, and is fairly lengthy. For example, "Eight little owls were dancing in a tree, wiggling and jiggling joyfully. From up in the branches the playful owls said: "We're feeling much too bouncy, and we won't go to bed!"" There are also little comments made by the owls in speech balloons. The background is a light denim shade with a darker blue tree in the center. The background slowly lightens to violet, then peach and a pale pink. The pages are thick and sturdy and the binding feels strong. Each owl is a different color, size, or has a little accessory to mark them apart. Only the final owl is given a gender and addressed as "he". Verdict: Cute, but not memorable. Purchase if you are looking for additional counting board books. Ostensibly, this is a book that's supposed to make kids feel that all genders can do anything. Unfortunately, it doesn't really work out that way. In the first spread, the title is repeated and expanded: "Pink is for boys. And girls." A pink-hued room is shown with the light-skinned boy and dark-skinned girl of the cover dressed in fancy clothes, the girl in a pink dress with long sash and the boy in light pink shirt and bow-tie. The following page expands this theme with the two playing piano for a roomful of dancing children, the girls all in pink party dresses, the boys in pink shirts, bowties, and dark pants. In the third spread and second color, "Blue is for girls. And boys." A blonde, freckled girl and Asian boy are shown in dirty baseball unicorns with blue sleeves against a blue sky. The following page shows a whole team of mixed genders and races with blue-sleeved baseball games against a green field. The theme continues - yellow is a fantasy castle, with a prince and princess wearing crowns. Green shows a boy handing a girl a flower and then the two racing through the woods together. Red is for racing cars. Orange is a popsicle stand. Purple has a blonde boy in a wheelchair with a unicorn balloon, which he imagines riding through the sky with an orange-haired girl. Brown is a giant teddy bear. Black and white shows two white children petting cats and dogs. The final spread brings together all the children from the book enjoying all the colors together. The pictures are bright and colorful, with swatches of color and splashes of leaves, sky, and cities across the background. There is an attractive diversity of race, size, and one representation of a physical disability. So, what's the problem? Well, if the book had been intended to reinforce traditional gender roles and the colors usually paired with them, then it would be fine. But that's not what the book is supposed to do. When "pink" is described, it automatically goes with a girl wearing a fancy dress. A boy wearing a pink bowtie is not exactly claiming the color for both genders. Blue is associated with baseball, a traditionally male color for a traditionally male sport. Strict gender division is seen again in yellow, with a traditional prince and princess. It's also problematic that the only physically disabled child is shown as dreaming of being without his disability, not actually doing anything. Some of the colors are more neutral, but the tone set by the first few overshadows the rest of the book. Verdict: The illustrations are lovely, but the book falls short of its message; and, in my experience, kids are more influenced by teachers and parents, not stories, when it comes to "boy colors" and "girl colors". An additional purchase if you have a large audience for didactic stories. We’ve gotten very into sewing and fiber arts at my library recently, and while I’ve very firmly refused to do any felting in the past (handing my library kids needles and telling them to stab things just seems like asking for trouble) this book is making me rethink that stance. The book begins with an introduction to the most familiar kinds of felt; synthetic felt, which is what most people are familiar with, and stiffened felt, which can be made with the application of glue or purchased in that form. There are several decorative crafts with these items, including a box and owl pillow. Then the book introduces real wool, or wool roving. This is the loose fibers which can be felted together, using either wet or needle felting techniques. Wool felt is also introduced, although it is, like roving, much more expensive than synthetic felt. The techinique of wet felting is introduced, and here I felt was the one area of the book lacking as pictures of the process are shown, but no actual, step-by-step instructions are given, except for a general description. Needle felting is introduced in the same manner. The projects for wet and needle felting include more specific instructions and readers who want to try these more complicated techniques will learn to make wool balls, bracelets, a game board, and several other items. A couple additional titles are included and a short author bio. This series also includes titles on crocheting, knitting, and sewing. Verdict: This is a new title and has excellent content, except for the rather vague introduction to the wet and needle felting process. Definitely worth adding if you want to expand your fiber arts section and I look forward to using this series in maker workshops. We read Claymates at the 2nd grade tour and they laughed uproariously. The 5th grade tours went well; the first group was really into the scavenger hunt, but the second group had a lot of kids who wanted to just read instead. I was ok with that. Off-site visits was my traditional summer reading visits - I don't know if it really influences the kids, but the teachers like it and I do enjoy booktalking. I used my booktalking cards here and for the 4th and 5th graders, some of whom checked out books. I was kind of tired by the end of the week. A terrifying array of sweets, some very dim but possibly friendly (or possibly not) aliens obsessed with spoons, and some helpful robots all appear in this hilarious adventure. Ultimately, Astra must be brave and clever if she's going to outsmart the sentient cakes, escape the spoon-hunting aliens, and save the ship! Fortunately she has help from Pilbeam and the Nameless Horror. The book is illustrated in shades of orange and gray and, while just 200 pages, has fairly challenging vocabulary. I hung on to Larklight, Philip Reeve's nutty steampunk adventure of alien top hats and giant spiders, all circling around a large Victorian house as a space ship, for many years. I loved the crazy adventures and it came in with a very high lexile level, which was useful. But, alas, I found that my young patrons' dislike of steampunk and wacky British humor exceeded their desperate need for books with a high lexile. It is quite probably that the books will have to go on the next weeding cycle, which is coming up soon. When I was selecting books for the science fiction genre for my book club, I ran across this new title from Philip Reeve and couldn't resist selecting it to see if my readers would be interested. It did get picked by one reader, but they said it was too silly. Alas. However, I enjoyed it myself and I am happy it's available in our consortium in case I ever run into any other fans. Verdict: If you have fans of Reeve's previous silly books, or those who like this particular British vein of humor, this one is sure to be snapped up. If not, it's probably best to let it go.